Posted on Tuesday, January 24th, 2017 at 5:30 am. 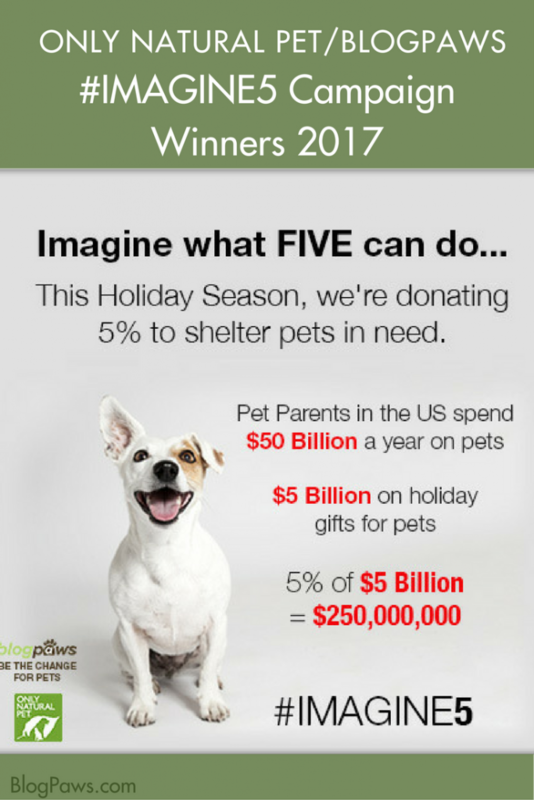 For the second year in a row, Only Natural Pet in its partnership with BlogPaws, set out to improve the lives of some of the nearly eight million pets that enter shelters in the United States every year with its #IMAGINE5 campaign. Five grand prizes of $1,000 each are being donated to five worthy animal rescue groups across the country. For every purchase of a toy, treat, bed or accessory during the 2016 holiday season, Only Natural Pet donates five percent of the purchase value to pets in need. Five lucky shelters split the final donation. This innovative, pay-it-forward campaign encouraged folks to share the #IMAGINE5 hashtag on social media and register a shelter to eligible for one of the five $1,000 prizes. All of the winners are U.S. based 501(c)3 organizations supporting animal welfare. Throughout the #IMAGINE5 campaign, there was no limit to the number of social media shares for participants, and each person could enter one shelter for consideration by random dreawing. The five shelters split the $5,000 and participants decided who those shelters were! Talk about a win-win. “This donation will make a big difference to us, helping us to feed 250 pets for a month,” says Eileen Lambert, Executive Director of the Colorado Pet Pantry, one of this year’s winners. Pitties & Purrs Rescue, Inc. Since 2010, BlogPaws, through its Be the Change for Pets movement, has donated over $100,000 in goods and services to qualifying 501(c)3 organizations dedicated to helping pets in need. 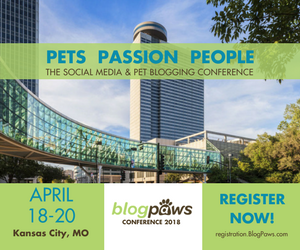 BlogPaws is one of the first companies to promote pets and their welfare via social media and the first to start a conference for pet bloggers and pet online influencers. For complete details, visit The Only Natural Pet #IMAGINE5 Campaign page. Only Natural Pet is a complete line of natural pet supplies specifically formulated by a holistic veterinarian to be biologically appropriate for cats and dogs. How are you making a difference in the life of animals? It only takes one step to make a difference. Tell us in the comments below.